The Jungle Book is one of the most celebrated Disney films of all time. A live version of the film was bound to happen some day. Given the success of Snow White & The Huntsman (which has a prequel/sequel on the way), Maleficent and Cinderella, it was only a matter of time before we seen Mowgli on the big screen. Fortunately for us, The Jungle Book is a well crafted and perfectly acted adaptation of the classic Rudyard Kipling story. Its hard to do a spoiler free review on a adaptation of a story that most people know. With that being said, The Jungle Book is probably the best live adaptation of a Disney story ever. Disney believed in the movie so much, that a sequel was greenlit before the film even hit theaters. Director Jon Favreau (Iron Man, Swingers) does an incredible job bringing this world to life. 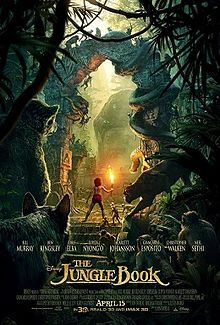 The jungle and the animals all look fantastic and each character is perfectly cast from top to bottom. Starting at the top, Neel Sethi plays Mowgli. The “man cub” who is raised by a pack of wolves in the jungle after being found by a black panther named Bagheera (Voiced by Sir Ben Kingsley). Bagheera stays around as Mowgli’s friend/mentor while Raksha (Lupita Nyong’o) acts as his mother. Problems arise when the dangerous tiger Shere Khan (Voiced flawlessly by Idris Elba) threatens the pack and Mowgli as he has a hatred for all humans. As the wolf pack debate on what to do, Mowgli decides to leave on his own. Not wanting anyone from the only family he’s know to be hurt. Upon his travels, his path crosses with Baloo (Bill Murray). A sloth bear who shows Mowgli a side of the jungle he’s never seen before. The fun side. Kaa gets a gender swap and is voiced by the sultry Scarlett Johansson, who can seduce me any day of the week. But that’s another story. And finally, the king of the Bandar-log, King Louie (the great Christopher Walken) brings the story full circle. And he is much bigger in this film than he is in the cartoon. Much bigger. The movie works. I saw this with my daughter, and we both enjoyed it very much. We found ourselves shocked at some of the sinister moments from Shere Khan, while humming along to the tune of “Bear Necessities”. Unlike Maleficent (which really only works because of the fantastic performance of Angelina Jolie *editors note* there’s a Maleficent 2 on the way), this movie isn’t trying to turn your childhood on its head. As a partial fan of the original movie, i can say undoubtedly that this film does it justice. It’s a rare film that both adults and their children can both enjoy. Pay attention Hollywood. This is how a great adaptation is done.